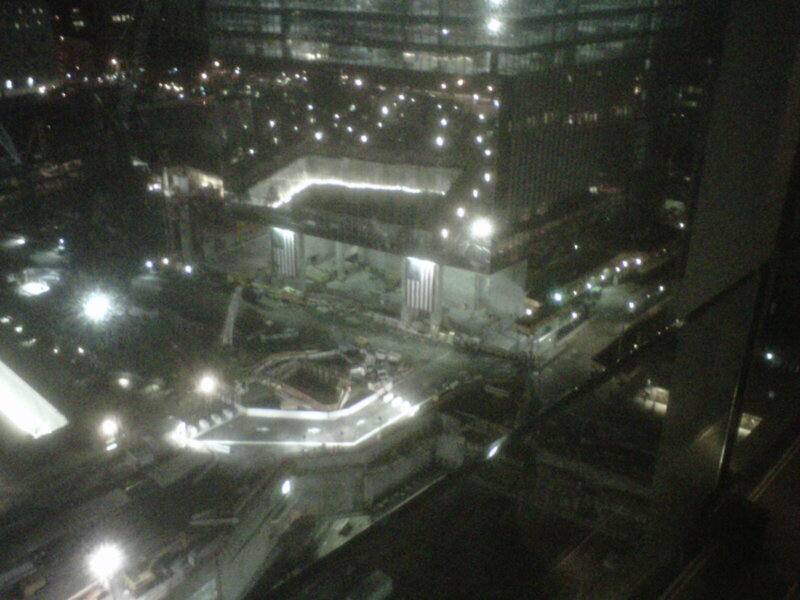 The World Trade Center site at night. My New York tweet: NYC explodes on senses. Urban amalgamation of people, culture, garbage, subways, character, passion, more people: Humanity amidst the chaos. Want more? Here’s another of my “travelogues” complete with cell camera images. Highlights from New York, late Friday to waiting for AA #335 at LGA today. Quarters World Trade Center) I could observe the hundreds who waited their turn to visit the 9/11 Memorial. All were orderly from what I witnessed. All could have spent their time at one of the hundreds of places that define New York. Yet they came here, hopefully to tour the memorial, reflect on those who perished and see firsthand the embodiment of American spirit. Elsewhere on the site, Freedom Tower continued to soar, as earth-moving machines relentlessly laid the groundwork for more development. 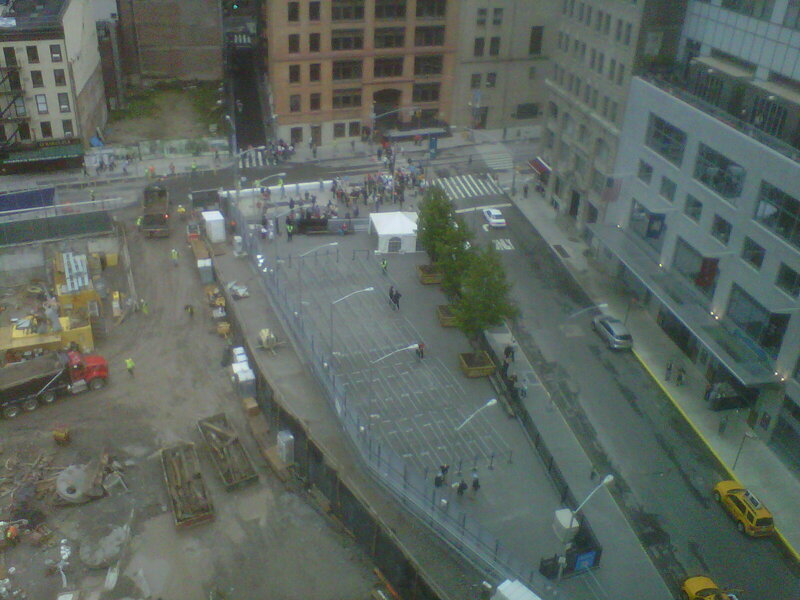 Ground zero from the 10th floor. Asia at the End of the 7 Train. The subway commute from downtown via the 4 train to Grand Central to the end of the 7 train in Flushing took just over an hour. It left me in a world where I was the minority. Flushing is an Asian polyglot community full of markets, restaurants, salons and what I was told is the heaviest street traffic outside of Manhattan. I believe it. It’s happened in other cities, including Chicago: A new ethnic group arrives, eclipses the old and thrives. Here, it’s done on a massive scale. Note the length of this seafood aisle in the image below. Lunch with myby commercial real estate friends Paul Fetscher, CCIM and Syed Quadri, CCIM at the New Imperial Palace was delicious, cheap and testimony to what defines this fascinating place: People like Paul, a native, and Syed, who arrived here 30 years ago, can thrive in a place like New York –by working together. 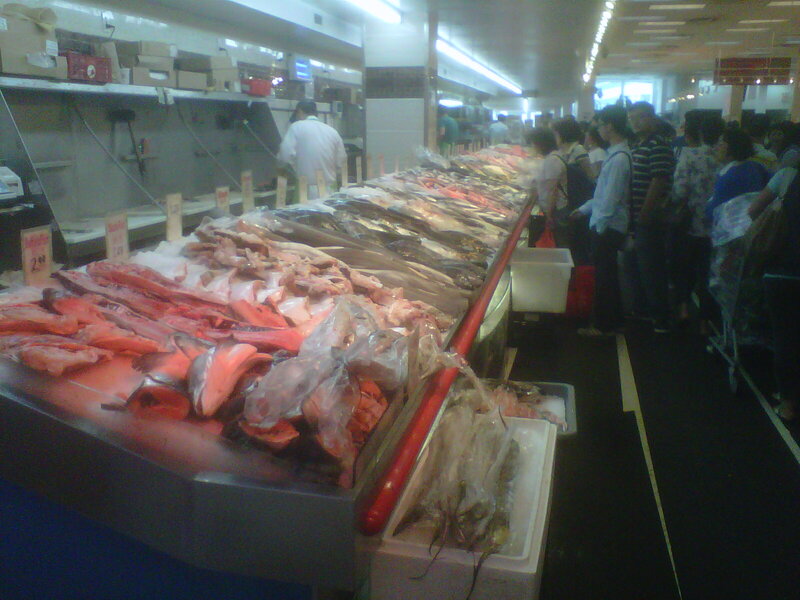 The seafood aisle in a market off Main Street in Flushing was astounding. 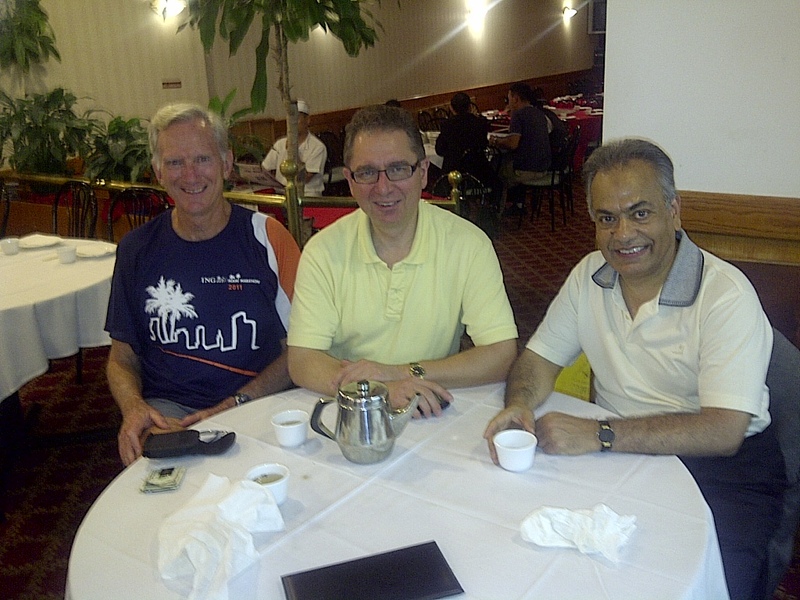 My great friends Paul Fetscher (left) and Syed Quadri (right). A Bittersweet Ending to My Commitment to Accreditation. My key purpose here was to attend what was my final meeting as a member of the Universal Accreditation Board, the governing body that administers, grants and markets the Accreditation in Public Relations (APR) credential. In between I ate, drank, explored and heard some great jazz; more on the jazz below.) In 2003, I was one of the first to pursue the APR under the re-engineered format that includes the computer-based Examination. It took me three tries, but I did pass, becoming the first from Chicago to do so under the new format. The challenges I faced and frustrations I endured – hey, I was a two-time loser – earning Accreditation only strengthened my passion for the credential and practice of strategic and ethical public relations. After six years on the UAB, I “retired.” It was an honor to serve and work with many PR professionals who are a lot smarter than me. I’ll miss the camaraderie, the challenges and of course, the opportunity to come to New York a couple of times a year. I’ll now be able to help professionals from Chicago who want to take the APR challenge. By the way, have you considered pursuing Accreditation? Stroll along the water. I took the images below on the Esplanade at Battery Park City. Remember, New York is an island, and much of the shoreline offers some pretty cool vistas and boat traffic. The subways. Something like 3 million people ride NYC subways daily. On my trek out to Flushing on the elevated 7 train, I saw parts of Queens I’ve only seen from the air. Plus, I group of strolling musicians performed a Mexican folk song on our car. And, they were really good. The architecture. The concrete and steel canyons of the Financial District downtown provide some of the most varied, interesting and diverse streetscapes anywhere. From the classically inspired Federal Hall to the new towers among the World Trade Center site, there are tremendous things to see. Music. My New Jersey buddy John Burke and I caught the Ravi Coltrane Quintet at the Village Vanguard, a legendary club in Greenwich Village. The cost was $25, plus a drink. We saw world-class jazz in a venue that was made for it. The rock clubs are gone, but jazz still thrives in New York. Food. Before the show, we took in a quick dinner at a small – not more than 30-seat – restaurant near the club. For a total of around 20 bucks, I had shrimp tacos, roasted red pepper soup and a side of Brussels sprouts. Everything was fresh and delicious. Judging by their accents, the young hostess and cooks came from another country to run a restaurant in one of the most competitive, expensive cities in the world. And they were succeeding. Drink. From the lounge atop the Club Quarters, I enjoyed a cold beer, had a great conversation with the young Russian lady bartender and had a penthouse view of the World Trade Center site — in all its soon-to-be glory. This cost $5.75 plus tip.I’ve been to New York dozens of times. I’m always enthralled. What about you? Do you love, hate or just tolerate New York? Share your thoughts. 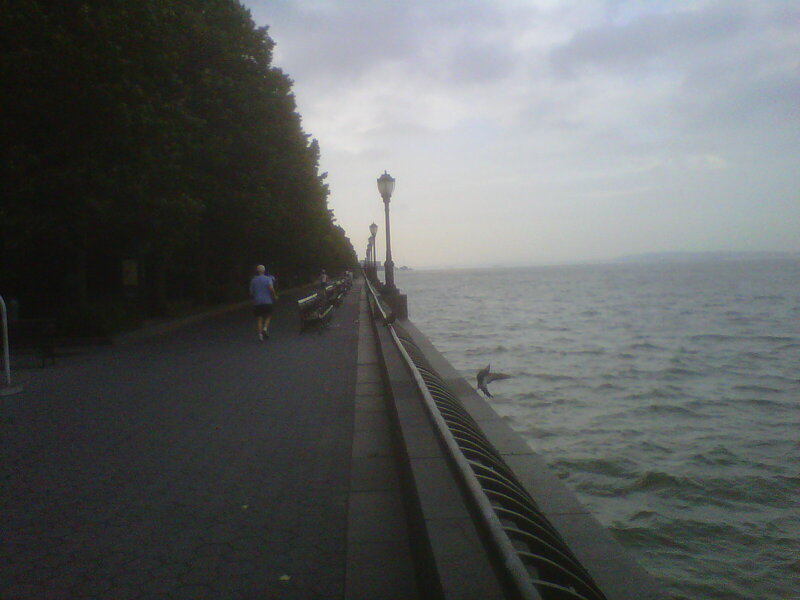 The Esplanade along the Hudson in Battery Park City. This entry was posted in Uncategorized and tagged APR, Flushing, New York, public relations, Universal Accreditation Board. Bookmark the permalink. Thanks for sharing. I love ny!